In addition to my food blog, I also write and co-produce plays with my wife. We’re in the midst of rehearsals for my newest play right now, Talking with My Dad, and so we’re doing some cast bonding that recently included going out to eat after a Sunday rehearsal. I had checked the menu of the place we were going, the Valley Lodge Tavern in Wilmette, Il., before we went and knew there was nothing on it I could order on my low-salt, low-fat post-angioplasty diet The place is an offshoot of the long-time fixture Valley Lodge in Glenview, Il., where I had many a tasty fish lunch years back when I worked nearby. 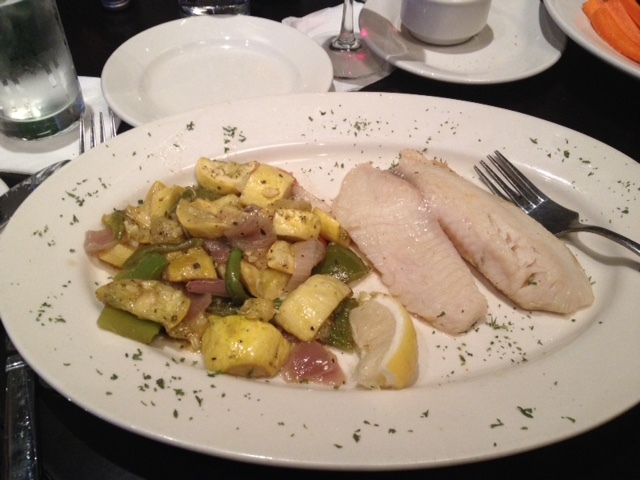 My plain tilapia and squash at the Valley Lodge Tavern, Wilmette. This new location didn’t list any plain fish options, but it did have some fish dishes I thought I might be able to get a bit plainer. A special the night we went was tilapia, covered in something I couldn’t eat. So I asked the waiter if I could just have plain tilapia and he said of course, which was very nice. I also got a squash side dish which I asked be cooked with no salt and no sauce. The squash was very peppery, perhaps a chef compensating for no salt? But all in all I enjoyed my dinner, including a glass of a robust chianti, and was able to eat with everyone else who were having chicken wings and other bar food staples I can only dream about these days. I have to confess though it is still very difficult for me to go to such places with people who can eat everything I once did but can’t any longer. Luckily that night, the great conversations we were having pulled me out of my malaise about the food situation.